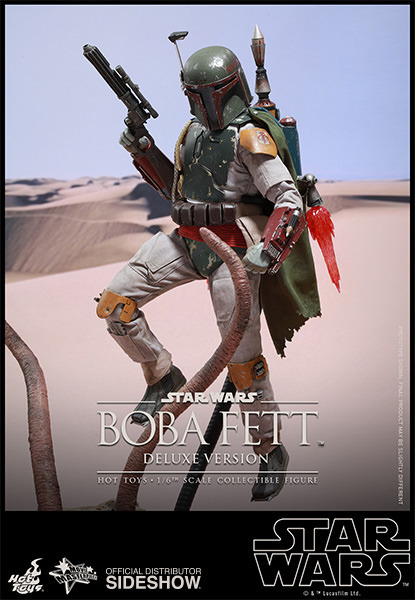 Today, Sideshow Collectibles and Hot Toys are excited to officially present the new Star Wars: Episode VI Return of the Jedi Boba Fett Sixth Scale Collectible Figure (Deluxe Version)! The highly-accurate collectible figure is specially crafted based on the image of Boba Fett in Star Wars: Episode VI Return of the Jedi. 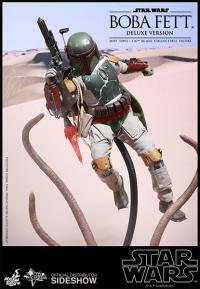 It features a finely sculpted Boba Fett helmet and armor, his signature jetpack, detailed weaponry, accessories, and figure stand. 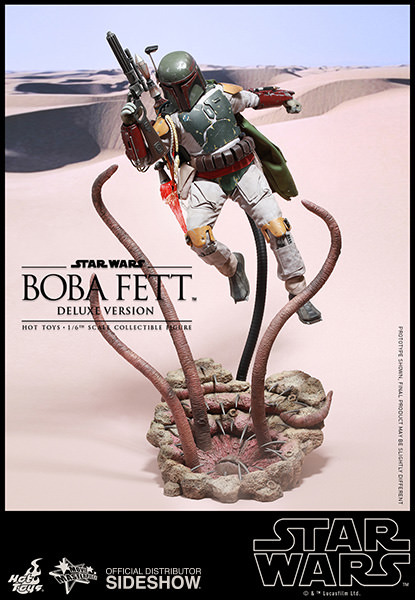 This deluxe version will exclusively include a specially crafted Sarlacc diorama figure base and two life-like jetpack thrust fire accessories! Just received my figure today and I am so happy I went with the deluxe, the base is incredible and well worth the extra $20!! Don't miss out, you will regret it forever . . . . This is the best Hot Toys figure I have ever seen or owned. The stand is SOLID and you will not worry like most do with Hot Toys guys and gals falling over and perishing. Hot Toys should learn a lesson with the success of the stand Boba comes with. The detail on this figure is unbelievable. I've bought several Sideshow and Hot Toys figures and this one is definitely my favorite. 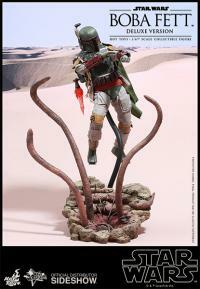 If you're a Boba Fett fan, you need to add this one to your collection. The Hot Toys Boba Fett with Sarlacc is really the biggest hit of Boba Fett Sculptures I've ever seen and bought! The similarity to the movie figure is extraordinary. 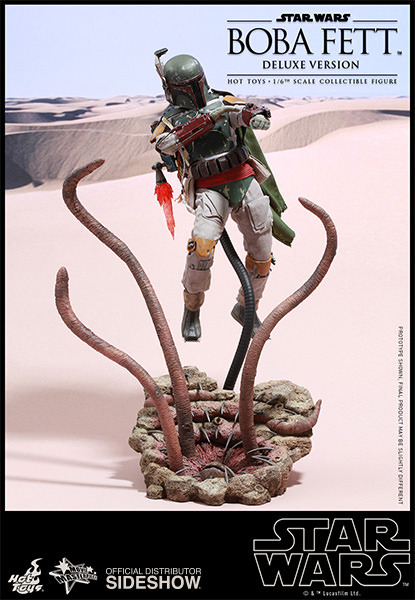 The idea with the Sarlacc stand is brilliant because it's a key scene according to his survival. 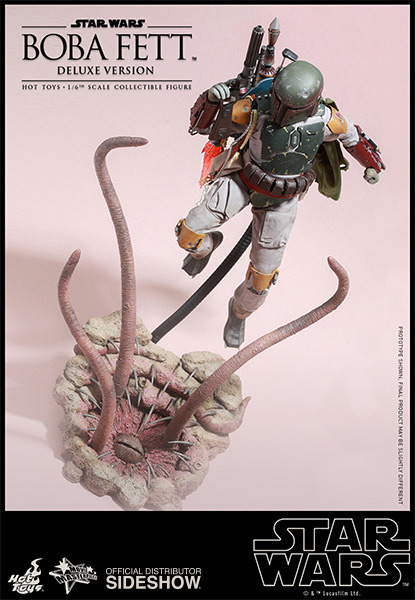 There's no beyond to this Boba Fett! Awesome! That's what I can say. The level of detail on this figure is great. Everything is so well put together and the presence it has is amazing. Don't hesitate to get this one, you won't regret it. This is my first Hot Toys and have to say is a must buy. It is sculpted and painted perfectly, i have mine right next to my TV and i think i look at this more often. Must buy if you like boba fett! Excellent piece by Hot Toys! I love it! A must for Star Wars fans!! Awesome figure. All the amazing detail that we've come to expect from Hot Toys. I'm really glad I went with the deluxe because the Sarlacc base is well worth the extra cost and allows for the some great display options. If you're a SW or BF fan...get it.